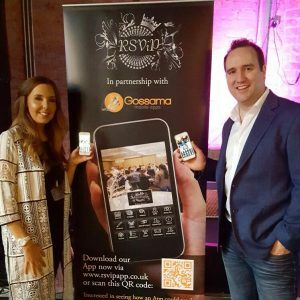 We are excited to have entered into a partnership with Gossama Mobile Apps, to launch our brand new interactive ‘networking’ app, which will allow members to keep tabs on the latest RSViP events, news on the move & to connect with one another in-between the events. Download it today by visiting www.rsvipapp.co.uk from your smartphone! When you first download the App you will be prompted to allow ‘notifications & messages’ – we suggest you allow these as they will enable RSViP to keep you up to date with the latest offers, event information and allow you to make the most of the GPS facilities within the App.